The 2019 Collision Repair Expo is part of Australia’s largest automotive industry trade fair being held at the Melbourne Convention and Exhibition Centre from April 4 to 6. Along with all the industry’s leading companies displaying world class products and services on the Expo floor, this three day trade exclusive event also includes a free seminar series for all visitors, following the theme of Understanding the Rapidly Emerging Trends and Developing Industry Leading Standards. “The collision repair segment of the Australian automotive aftermarket industry is constantly dealing with emerging technologies and repair techniques along with new and exotic materials. This makes it particularly important for members of this industry segment to be informed and updated by the experts on the latest developments, along with gaining support to assist them in building bigger and better collision repair businesses,” stated Australian Automotive Aftermarket Association CEO Stuart Charity. “In partnership with ICAR we have assembled a quality free seminar series that takes place throughout each of the three days of the 2019 Collision Repair Expo. I am confident that these seminars will prove to be invaluable for all who take part,” Mr Charity added. The seminars start with two presentations on the opening day of the Expo, Thursday April 4. At 2:00pm, Albin Hess, Kaeser National Design and Engineering Manager, will outline the importance of compressed air quality and the different compressed air treatment technologies that are available to produce dry, premium quality compressed air for collision repair workshops. Subaru Australia then takes to the Expo seminar stage at 3:15pm on Thursday with the first of two Repairability seminars to be conducted during the Expo. This seminar will highlight the importance of maintaining vehicle integrity in structures and driver assist technology. Specific collision repair requirements for the Subaru vehicle range will also be covered during this one hour seminar. Friday April 5 features a total of four Expo seminars, starting with Understanding Volkswagen Repairs at 10:30am, presented by Daniel Milutinovic and Santo Biviano from Volkswagen Australia. This seminar will outline the importance of repairers having the correct equipment, training and understanding of the materials used across their vehicle range. Vehicle manufacturer representatives from Holden, Ford, Volkswagen and Subaru will present Friday’s second seminar at 12:00pm, titled Repair and Prepare for the Future. These OEM panellists will discuss the collision repair requirements that will be essential for future business growth, making this a vitally important seminar for collision repair business owners, managers, apprentices and professionals. Expo special guest Dave Luehr of Dave Luehr’s Elite Body Shop Solutions presenting a highly entertaining portrayal of his popular book, “The Secrets of America’s Greatest Body Shops.” Dave will share the lessons that he has learned from successful collision repairers worldwide. The main lesson being that shop leaders with the right mental attitude can achieve incredible levels of success. He will also use this seminar to explain why right now is the greatest time in history to be in the collision repair business – if you have the right mindset. At 2:15pm on Friday, a special panel based discussion will take place titled Ideas Collide. This seminar features five fast paced and thought provoking presentations that will include ideas and concepts that have the potential to revolutionise the collision repair industry. Friday’s fourth and final Expo seminar takes place at 4:00pm and is titled Vehicles and Technology: Tomorrow’s World Today and it will be presented by Bosch. This informative presentation outlines the coming trends that will bring new challenges to automotive repairers, including electrification, mobility, connected cars and driverless technology. The final day of the Expo, Saturday April 6, features another four informative seminars starting at 10:30am with Mixed Materials, Repair Methods and Technology. Presented by a panel of vehicle manufacturer representatives, the now and why of collision repair methods, materials and technologies will be discussed from the OEM perspective. The second international Keynote address of the 2019 Collision Repair Expo takes place at 11:30am on Saturday and it will address a very important current issue for repairers relating to ADAS and how cars fitted with this system are increasing repair technology demands. Special guest speaker Andrew Marsh, Engineering Director of Auto Industry Consulting Ltd will discuss in detail how the globally fitted ADAS systems are causing universal uncertainty relating to the requirement of enhanced electronics and software skills for collision repairers. At 1:00pm on Saturday the Expo seminar stage hosts a second Subaru Repairability seminar that will outline on going developments along with specific collision repair and vehicle structure requirements for the Subaru vehicle range. The final seminar for the collision repair sector takes place at 2:00pm on Saturday and it will be a second presentation of Understanding Volkswagen Repairs presented by Volkswagen Australia. There is no doubt that the 2019 Collision Repair Expo Free Seminar Series will provide enhanced training, knowledge and advice for collision repairers who seek to grow and develop their businesses, from a range of highly experienced industry professionals and vehicle manufacturers. 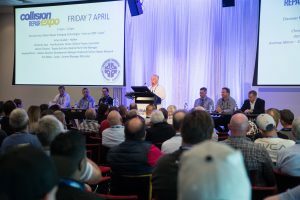 Now is the time to ensure that you are registered to attend the 2019 Collision Repair Expo and to take part in some or all of the outstanding free seminars taking place throughout this massive three day biennial industry event. Collision repairers can register to attend the Expo and seminars free of charge at www.collisionrepair.com.au.